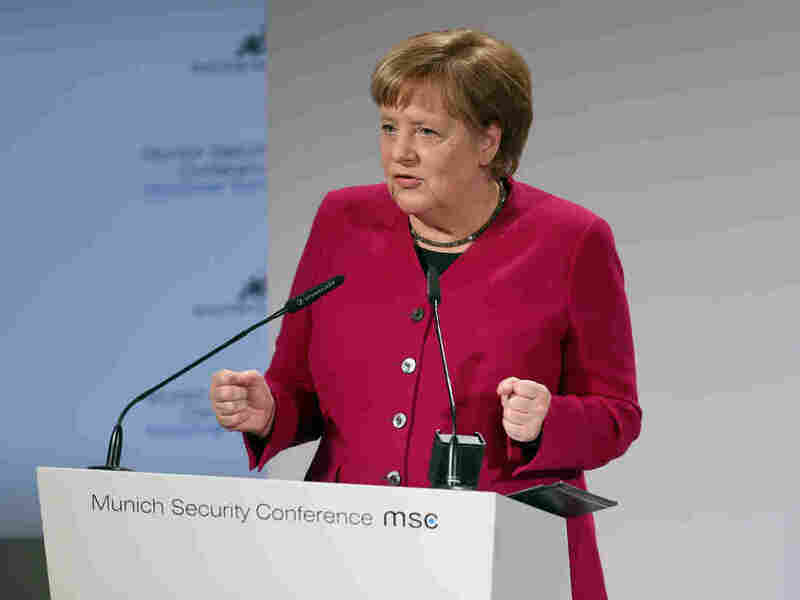 Munich Security Conference Reveals A Growing Rift Between U.S. And Its Allies German Chancellor Angela Merkel received a standing ovation for a speech that critiqued U.S. foreign policy. Meanwhile, U.S. Vice President Pence defended U.S. global leadership. German Chancellor Angela Merkel and U.S. Vice President Pence talk at the Munich Security Conference on Saturday. The U.S.-led liberal world order is falling apart, according to the organizers of a gathering of world leaders and defense chiefs in Germany that has met annually since the Cold War. The Munich Security Conference report said the Trump administration displays an "irritating enthusiasm for strongmen across the globe" and "disdain for international institutions and agreements." For much of this past week, the growing rift between the U.S. and its traditional European allies has been on display. First, in Warsaw, Poland, the U.S. organized a conference seeking to marshal international outrage over Iran, and Vice President Pence urged France, Germany and the U.K. to abandon the Iran nuclear deal, accusing them of concocting a "scheme" to continue to business with Iran. Top European allies trying to keep the nuclear deal alive declined to send top-level diplomats to the conference. Then on Saturday, in Munich, German Chancellor Angela Merkel addressed the security conference with several critiques of U.S. foreign policy – and received a sustained standing ovation. 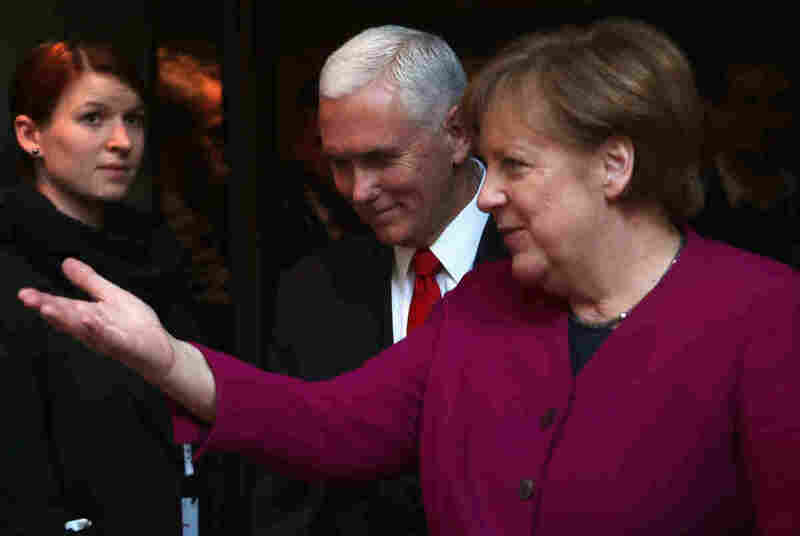 German Chancellor Angela Merkel received a standing ovation for a speech that criticized U.S. foreign policy, including the decision to withdraw troops from Syria. She resisted Pence's calls to withdraw from the Iran nuclear deal, arguing the deal can help countries pressure Iran over issues that concern the U.S.: Iran's ballistic missile development and its role in wars in Syria and Yemen. Merkel also criticized the U.S. decision to withdraw its troops from Syria. "Is it a good thing to immediately remove American troops from Syria, or will it not strengthen Russia and Iran's hand?" President Trump's daughter Ivanka, who was in the audience, did not join the applause that followed. 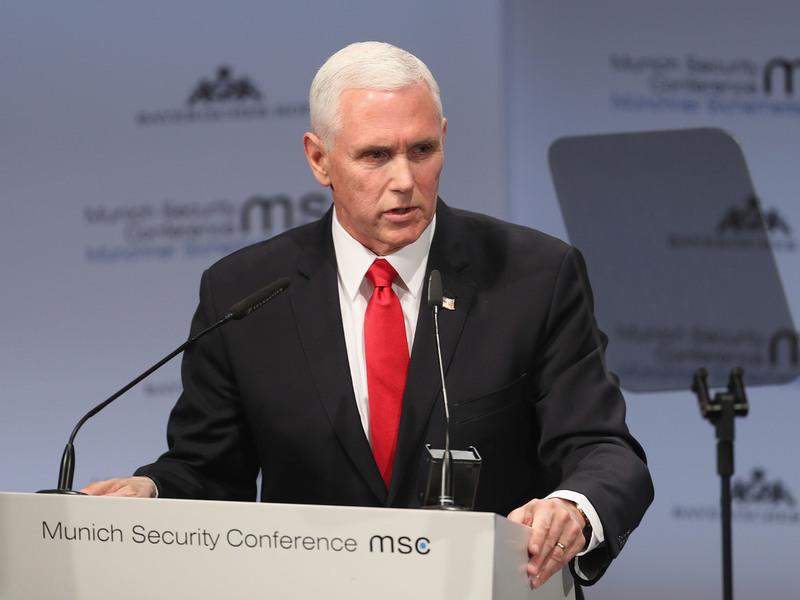 Pence defended U.S. global leadership in a speech to the conference, saying NATO member countries have boosted their defense spending thanks to Trump's urging. "That's what we call being leader of the free world," he said. The end of speech was greeted with short, muted applause. U.S. Vice President Pence got muted applause when he spoke about U.S. global leadership, noting NATO members have increased their defense spending. "European leaders are doing themselves no favors in bashing Trump," wrote Judy Dempsey, a nonresident senior fellow at Carnegie Europe. "Even if Trump was to be defeated (and that's a big if), a change in the White House is not going to fundamentally change the dynamics of what is happening in Europe." She noted China's interest in acquiring strategic assets in Europe and "the toxic combination of China and Russia's ambitions to divide and break the West." A power competition is emerging among the U.S., China and Russia, and other countries are unwilling and incapable to step up as guardians of the "liberal order," the security conference report argued. A new Pew Research Center poll, published in the report, suggests that Germans believe Russia's Vladimir Putin and China's Xi Jinping handle world affairs better than Trump does.